Although very similar to the classic single-stemmed rose in many ways, spray roses are beautiful and versatile flowers that can be used in a wide variety of arrangements and bouquets. 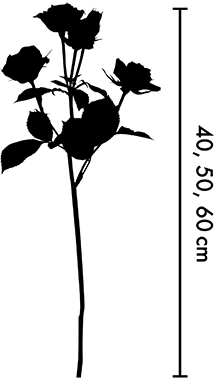 The main difference between the two types is the stems: while the traditional rose contains a single bloom, spray roses can have several heads along the laterals, giving them a “spray” effect. Our new Baby Rio Spray Roses are distinctive because they are non-disbudded, which gives each of our bunches more volume, blooms, and a higher perceived value.